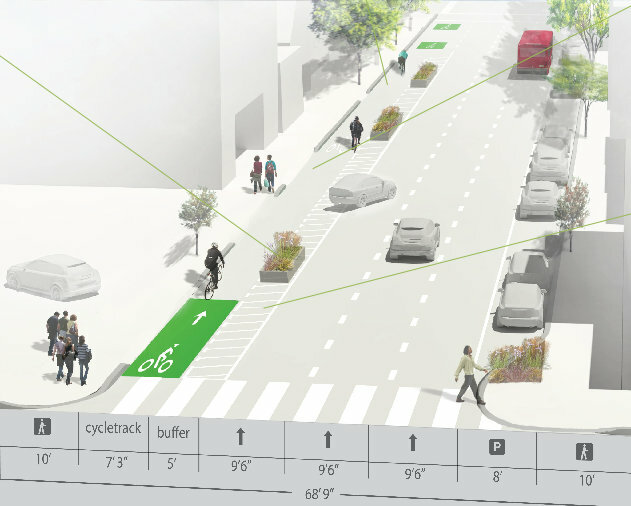 Construction of the final pieces of bike and pedestrian safety improvements on Fell and Oak Streets between Baker and Scott has been delayed again as the agency finalizes the design of traffic islands and bulb-outs. 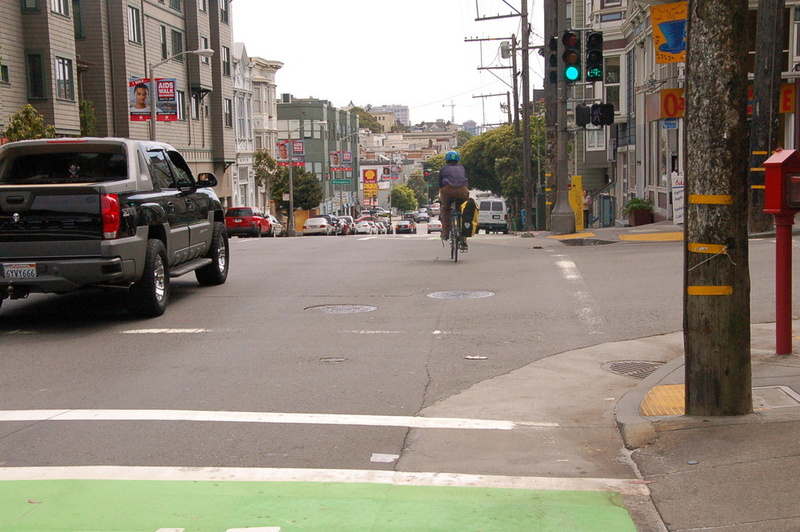 Previously promised this year, the upgrades have been pushed back until some time in 2014, according to the SFMTA. SFMTA Livable Streets spokesperson Ben Jose said the SF Public Utilities Commission is helping the agency “enhance the corner bulb-outs to capture stormwater and beautify the project in parallel with the safety benefits the bulb-outs inherently offer.” The landscaped traffic islands, also known as concrete planters, will be installed in the buffer zones of the Fell and Oak bike lanes to help separate bicycle commuters from motor traffic “in coordination” with the bulb-outs. All of the planned safety improvements that don’t involve concrete work are in place. The long-awaited curbside bike lanes on Fell and Oak, currently separated by buffer space and temporary plastic posts, were installed in September 2012 and May of this year, respectively. Along with the lanes, the SFMTA installed bicycle traffic signals and more visible ladder crosswalk markings, while also lowering the synchronized traffic signal speeds from 25 to 20 mph. The block of Baker between Fell and Oak was also put on a traffic-calming road diet and had parallel parking spots converted to back-in angled parking spots. As we reported yesterday, those improvements are yielding promising results, improving safety and comfort along the route. However, we still hear reports of drivers stopping or parking in the bike lanes, which the traffic islands should help discourage. The landscaped bulb-outs and islands were originally expected to be completed this past spring. The bike lanes themselves came after years of advocacy for safer streets (the Oak lane was only installed in time for Bike to Work Day because D5 Supervisor London Breed pushed the SFMTA to expedite it). Is the latest delay a disappointment, or is it worth the wait to get the design of these finishing touches right? Let us know what you think in the comments. Take the time to get it right if needed, MTA, but please do install additional soft-hit posts in the meantime. hopefully the concrete planters will be a little narrower than shown in the initial plan so that there is more room ride in the lane. the lane will be pretty constricted once they are in place if they take up the entire buffer. There’s so much work to do to make this a legit bike lane. On a side note, if MTA would put red paint where that van is parked, I bet people wouldn’t park there. Literally almost every day I pass here, there is at least one car parked there. That there is still not red paint there is hilarious and depressing.